Did you know that belay can be defined as a noun as well as a verb? I learned something new when I did my research to write this article. It is so wonderful to always be learning. In rock climbing, I usually refer to belay as a verb. In this article, we will be discussing briefly “what is a belay” and specific information on how to belay someone on top rope for an indoor gym. There are multiple ways of belaying. 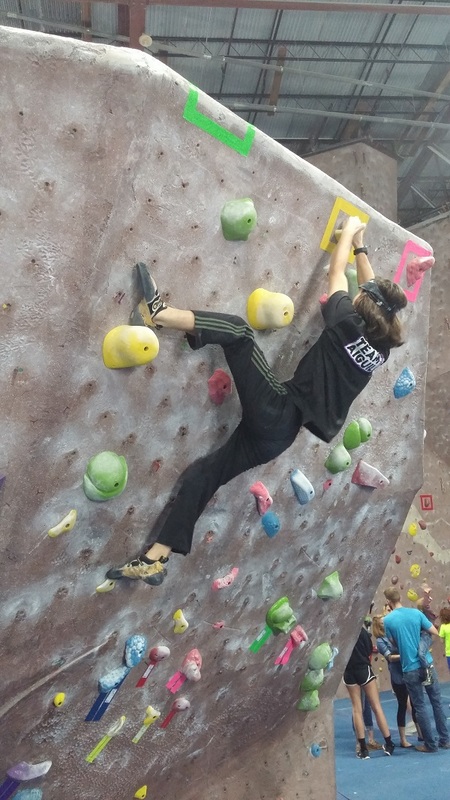 Use this article as reference to prepare you for an actual lesson at a climbing gym. 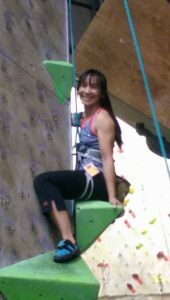 Before you can climb at any gym, you are required to take a belay lesson at their gym. If you know how to belay, you will be asked to demonstrate. When you are belaying some one, you are considered to be a belayer. The belayer is the anchor for the climber and plays an important roll in sport climbing. He or she handles the rope while the climber climbs up a route. The belayer catches the climber when fall or lower the climber down to the ground when the climber completes climbing a route. As a rule of thumb when a climber is heavier than the belayer, consider tying the belayer in to a ground anchor such as 50 to 100 pound sand bag. A sand bag is generally available at climbing gyms. If you do not see one, inquire about it. please refer to article on gears (www.rockclimbingforwomen.com/gear). There are different types of belay devices for indoor as well as outdoor climbing. Learn them when possible and use a belay device that is most comfortable for you. For indoor top rope climbing and simplicity, we will go over how to belay with a tubular belay device. You can use this belay device for indoor as well as outdoor. Attach the carabiner and a belay device through the main loop of the harness you are wearing. Find the rope close to the end, bend the rope and push it through one side of the belay device. If you are right handed, you would push it through the right side as pictured. If you are left handed, you would push it through the left side of the belay device. Unlock and open the carabiner. Loop the rope that you just push through and line it up next to the belay device. Once the rope and the belay device are looped in, lock the carabiner. The bottom rope which is more closer to the end of the rope should be your break. 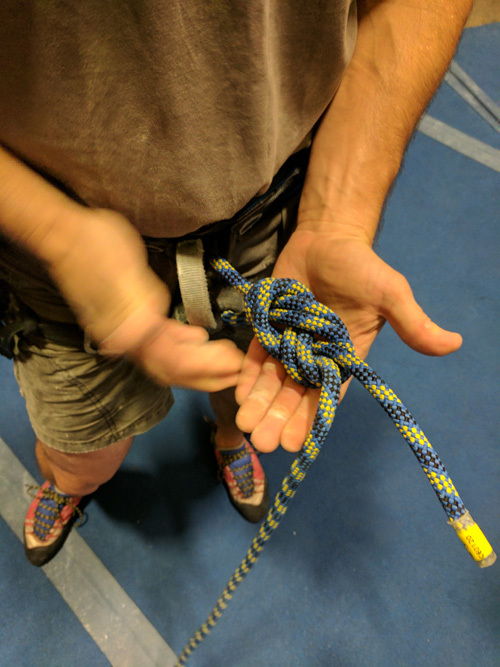 The top rope is the rope that will be connected to the climber where the climber would tie in his/her harness to the figure 8 knot – see article on how to tie in to the figure 8 knot. Are the belay device and rope attached to the carabiner? Is the carabiner connected to the main loop of the belayer’s harness? knot as a safety knot. In this case, we have only enough for one loop instead of two loops to make the double fisherman’s knot. Finally, tuck in all loose articles dangling from climber’s harness. 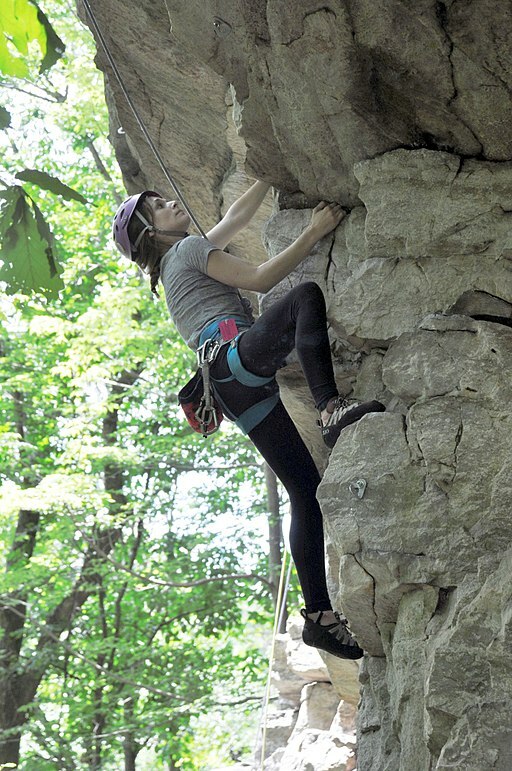 Climber: “On belay” — are you ready? Belayer: “Belay on” — I am ready. Climber: “Climbing” — I am climbing. Belayer: “Climb on” — I am ready to catch you. Climber: “Take” or “Tension” — bring in the extra rope and make it tight. I want to rest a little bit while hanging on the rope. Belayer: “Got you.” — I am pulling in the extra rope and making it tight. Climber: “Slack” — Give me more rope. Belayer: Slide out more rope for climber and pause for climber next command. Climber: “Ready to lower.” — I am ready to be down. 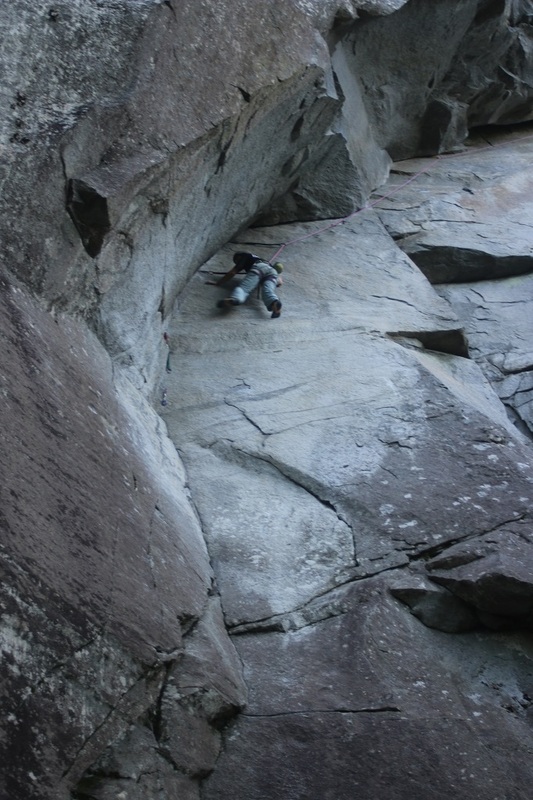 Climber: “Off belay” — I am on the ground. Belayer: “Belay off” — I am done belaying. Belayer: Be alert and ready to put on the brake when necessary and be prepared to catch a fall. When top rope belaying for an indoor gym, most of your time will be taking in the slack as the climber is climbing. Use your dominant hand as the brake hand. I am right handed so all of my belay pictures are examples of belaying with my right hand. Always be prepared to catch a fall by braking with your dominant hand. I position my right hand at least six inches below the belay device and firmly hold the rope down by my side. The rope is instantly locked in place. I would avoid being too close to the belay device. If the climber falls suddenly and my hand is too close to the belay device, I could get pinched into the belay device and the rope. This could be painful and at the same time put the climber at risk of me dropping the rope. Your knees are slightly bent and your body is relaxed and alert. Your feet are shoulder width apart. The dominant hand is ready to brake when necessary and your opposite hand will be the guiding of the rope for the climber. My brake hand should never let go of the rope during the belay. It is always ready to catch the climber’s fall with a motion pulling the rope down below the belay device. I pull the rope up and away from the belay device as high as I can reach without over extending my arm. With the other hand, grab the rope a little higher above my brake hand. While the opposite hand is holding up the rope, slide my brake hand down closer to the belay device. When the rope is tight while waiting for the climber to continue to climb, I bring my brake hand and the rope down below the belay device. Continue and repeat the pull, grab, and slide motion to reduce the slack from the rope until the climber complete the climb. When the climber is ready to be lowered, the climber calls out “Lower me”. The climber lean back into a sitting position and legs can be propped against the wall. The belayer reply “Lowering”. The belayer brings the guide hand under the brake hand. With both hands on the rope, slowly feed the rope through the belay device and lower the climber. Keep a constant speed while lowering the climber and pause when there are possible obstacles like other climbers. Continue to lower the climber down to the ground and allow the climber to land safely with two feet firmly on the ground. Once the climber is safely on the ground, the climber calls out “Off Belay” and the belayer replies “Belay Off”. All the instructions may seem overwhelming for your first time. However, it becomes second nature when you practice it in the gym with your partner. Safety rules all. With safety practices and habits incorporated at all time, your mind will feel confidence and enjoy the process of rock climbing. Climb on my friends. Please feel free to comment below and add anything I may have missed. I love to hear from your perspective. Thank you for your visit.